Pakistan has been abismal with the bat throughout the world cup group stages and barely reached the quarter finals where they would lock horns against home favorites Australia. Going into the game nobody gave Pakistan any chance of getting the better of aussies in their own backyard, after winning the toss Pakistan decided to bat first but failed to take initiate and posted a very weak 213 score. Australia were favourites to win after their great bowling performance but if there was any team who could defend this total it is Pakistan. Pakistan got the early wicket of Finch before Wahab Riaz came to bowl, who has been the best performer from Pakistan in the world cup with 16 wickets to his name. He was all fired up and used his pace and bounce in the wicket to great effect and got dangerous looking David Warner on third man. He put Michael Clark under pressure with constant short pitched deliveries and got him out on a short ball. Australia were 59-3 and couple of more wickets here will surely put Pakistan in driving seat. Watson walks in and Riaz smells blood as he runs in every ball and scare the life out of Watson for 3 overs. Here is the video which will describe the situation better than the words. the video is a highlight of the spell with no commentary. This fiery spell got a massive reaction from commentators, experts and fans on twitter. 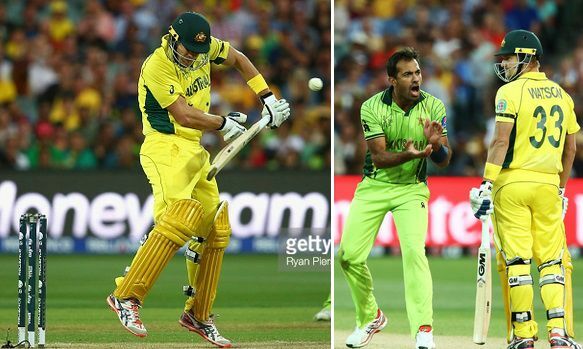 Some hailing it as the best bowling display of 2015 world cup. here is some reaction from Twitter. Brian Lara was impressed by Wahabs pace and strength. Omg!!! What a spell and now a drop catch!!! Shane Warner praised Wahab Riaz during live commentary, stating this is one of the best bowling spells he has seen in a long time. Pakistan quick bowlers are on fire here in Adelaide ! Game on, I still feel Aust will win though, but it’s nice to see the fire Pak, agree ? Indian legend Kapil Dev was also full of praise for Wahabs fiery spell. Former Pakistan fast bowler wasim akram also enoyed what Wahab had to offer. Enjoying the spell from Wahab he is pumped up big time . In the end it all went Australis way as Watson hanged in there after that dolly of a dropp catch and guided Australia to a comfortable win in the end. But Wahab Riaz bowling really inject some great excitement in the match.